I see the tall, barren trees outside my window. They appear lanky and dark and somewhat bleak as they lean crookedly in the snow. It is a stark beauty...the little woods behind our house. An austere and unadorned graceful scene. Silent and pure. A palpable stillness that seems to hush the noisy and frantic chaos that overwhelms the season this time of year. I like this woods of ours. It reminds me of another woodland that I used to walk in by myself when I was a girl. I remember the peace and quiet of being the only person among the trees. I used to ice skate alone on a small patch of frozen pond hidden in the middle of my youthful woods. I was a bit fearful yet even at such a young age, I felt comfort in the serenity of the quiet wintry glade. So it is today, I embrace the restful tranquility of the woods in winter. A light flurry of snow is falling now. Soon the trees will be draped in glistening white. 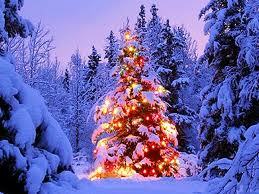 At night the stars shine through the empty branches and the moon casts glimmering beams of light onto the snowy ground. Christmas is near. It's as if this little forest, in it's own unpretentious way, is preparing to welcome the Christ child. A very peaceful Christmas to one and all. Let's face it. Things have been rough over the last several years. The economy is still horrific. Unemployment is rampant. You yourself might be out of a job or worried sick about losing one. Home values have sunk lower than 2 rats in a sewer pipe. Millions have lost their homes to foreclosure while others can't sell at a decent price. We're still at war in the Middle East. We can't even fly on a plane without first enduring humiliating gropings at the airport by security agents. And have you bought groceries lately? Thirty dollars for ingredients to make a single batch of holiday sweets. Life is indeed rather messy and complicated. Now it's Christmas time and we're supposed to be all hyped up, starry eyed and excited. Cheerful and joy filled and glowing and singing and making merry. However, given the world's gloomy circumstances, this year it's not all that easy for people to be merry and bright. Even if we're not feeling the holiday spirit, how can we embrace the magic of the season in a simple, unadorned, unpretentious, perhaps even childlike manner? For myself, I find the magic in people around my neighborhood and in my community. I volunteer. I've prepared meals for folks in need. I visit an elderly gentleman who is all alone. I sit and chat with him and mostly listen to his stories. I bring him food and home-made holiday sweets. In him, I see the magic of Christmas. Although he's lonely and not well...he radiates hope, positivity and even humor. I never hear him complain. He inspires me to be a kinder, gentler, more understanding person. I provide gifts to underprivileged children. Watching their little faces beam in anticipation as they grab each package and tear it open...is truly priceless. The other night, I looked up at the stark, cold but brilliantly clear sky and was amazed at how resplendent the stars appeared. I gazed at them for several minutes hoping to see a shooting star. No such luck. Yet I could see the constellations gloriously twinkling in the heavens...as if a trillion diamonds had been tossed into the celestial firmament. I was humbled and impressed at the same time. It's late afternoon and a gentle snow is falling. A winter wonderland outside our door. A friend of mine described watching the snow from her window to "sitting in the middle of a snow globe". What an apt description. A blanket of white that hides the ugliness of the world...if only for a little while. We live in a neighborhood of mostly boomer age folks...no kids. Last week, one of the neighbors had their grandkids over and playing outdoors. The youngsters constructed a trio of hilarious snowmen. They outfitted the snow people with silly hats and scarves, sunglasses and twigs for arms. One snowman was leaning sideways at a 45 degree slant as if the wind had blown him nearly over. I laugh every time I drive by. At midnight, in the woods at the back of our yard, I can see the deer resting in the snow. The glow of the moon illuminates them as bright as daylight...as they lie in the deep, white snowy mounds. Around them, scurry rabbits hunting for food or shelter in the stillness of the night. I can plainly see the rabbit trails they make, even though it is night time. High up in the trees I observe huge, dark blobs. It's the wild turkeys sleeping in the tall branches to avoid predators. What a fascinating world it is outside our wintry windows. 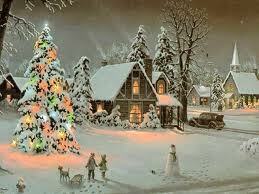 Snug and warm indoors, I light candles and turn on the tree lights and play soft Christmas music. Our adult children, spouses and grandsons are visiting this year. Cozy on the sofa with hubby, surrounded by loved ones and telling Christmas stories to our wide-eyed little grand boys as they listen in innocent, rapt wonder...is the best magic of all. The holidays are upon us. But before you know it, they'll be over. And you'll ask yourself...What happened? Where did the time go? Did I really accomplish anything worthwhile? Where did all our money go? Why am I so depressed? For millions of people around the world, December is a whirlwind month that races by so fast and furious, it leaves many folks melancholy, angry, frustrated and deeply in debt. But hold on. Back up. There's good news! This year, we still have a jingle bell window of opportunity to avoid or at least reduce seasonal meltdown and all the frazzled, crazy commercialized nonsense that comes with it. I have a plan, my friends, to bring more genuine cheer into your Christmas. More laughter. More simple joy. Follow just a few of my suggestions and you will reduce a lot of your holiday stress, anxiety, panic, self-loathing and those beastly migraines. And you'll still have some bucks left in the bank too. OK. Now stick with me here. I'm not a miracle worker. It is entirely your choice. You've got to be willing to be bold and fearless. You can't be afraid of what your relatives and friends will think. You cannot be afraid at all. Replace fear with determination, creativity, positivity and old-fashioned thoughtfulness. Then take your check book and your credit cards and put them where you won't use them. Remember, you have to be bold. Most Christians and many non-Christians, love the idea of Christmas. The decorations, tree lights, food, gifts, Christmas cards, Santa Claus, holiday music, falling snow, the look of children's faces on Christmas morning, the story of Jesus's birth in Bethlehem. We cherish all these beautiful Christmas images in our minds and then every year, we fall all over ourselves trying to achieve the perfect Christmas. Have you ever tried to downsize Christmas? Of course, I realize it's not a new concept. You hear people talk about simplifying Christmas all the time. Don't be extravagant. Cut back. Yet, it's mostly talk. But have you ever thought how absolutely insane Black Friday shopping is? This year many stores held a pre-Black Friday on Thanksgiving Day and thousands of folks skipped a traditional family Thanksgiving dinner to go....shopping. Some shoppers even carried guns thinking they could strong-arm their way to the front of the lines. Is it just me or is this just so wrong? When you think about it, most of the Christmas images we hold dear are simple ones...a tree, cookies, the manger scene, nostalgic carols, snow, a cozy fire in the fireplace, glowing candles, a gathering of loved ones. It's the expensive gift-giving, extravagant parties, ornate decorating and other frenzied holiday hoopla that makes us crazy. So here are, in no particular order, a few ideas to help you have a more cheerful, less costly, less stressful, better organized, more-quality-time-with-family, simpler, peaceful and perhaps even slightly unconventional yet decidedly merrier Christmas. 1. Stop moving. Sit down by yourself with a pen and paper and contemplate before you do another thing. Think about what's really important to you and your family. Is it really all about the commercial gifts? Duh, yah...if you have younger children or teens...yah it's still all about the gifts. But if you plan well ahead and I realize we don't have a lot of time this year...you might make them understand at least a little bit, that this year there will be more love and less loot under the tree. If they don't like it...strap them on top of the car and leave them there til New Years. 2. Dump decorations. Go through your boxes of holiday decor and toss out all the cheesy junk. Yes, some of it may be sentimental. But nobody would miss a lot of your silly chotzkees if you didn't use them. And obviously, I can't spell chotzkees. Stick to a one or two color theme. You don't need to unwrap and display all 347 of your Christmas collectibles. Arrange a handful of your favorite Santa or nutcracker collections all in one place rather than scattered about. 3. Candles, candles, candles. Use real ones or those nifty and safe battery operated ones. You can buy 100 tealights for under $5. Candles add a cozy glow, romantic light and a festive atmosphere for little money. Line the mantel. Put them in an unused fireplace. Set them on the coffee table. Of course, be careful with them around children. 4. Take a walk in the woods. Go by yourself, with a best friend or with loved ones. Luxuriate in the quiet. While you're in the woods...and you can find a wooded area or park someplace near where you live...pick up dead branches, evergreens, pine cones, all sorts of nature stuff to use for amazing decorations. And the best thing is you can throw it all away after Christmas. No storage needed. 5. Oh Christmas tree...how lovely are your branches. I confess. I like having a Christmas tree. As a matter of fact, I display five trees in our home. At first that hardly sounds like I'm downsizing. But here's the thing. Use what you truly love and don't unpack the rest. We don't live in a mansion but we do have a nice, dry basement. So here's my trick for putting up and decorating five beautiful Christmas trees in less than 30 minutes. Call me the Rachel Ray of Christmas trees. I use realistic but artificial evergreen trees. I keep the lights and all the ornaments on each tree all year long. I secure the ornaments to the branches so they don't fall off. After the season is over, I cover each tree with a big white sheet and haul it down the basement for storage. It's easy and hassle free. Once the tree is set in place for the holiday, a bit of tweaking the branches and ornaments might be in order. But for the most part, the hard work is already done. I don't have to lug all the heavy ornament bins upstairs. I don't have to unpack ornaments or lights. I don't get aggravated trying to untangle the lights and arrange them on the trees or yell at my husband that he's got it messed up. I don't have to spend hours placing ornaments on the trees. And I don't have to waste time removing all the lights and ornaments and rewrapping and repacking everything. The concept of keeping the lights and ornaments on the trees year-round will save you a tremendous amount of time that you can use to bake cookies, tell your little ones a Christmas story or just sit around and wax nostalgic over the memories associated with each ornament that graces your tree. 6. Use remote controls. Simple. Easy. Time-saving. You can buy remote sets that need only one control panel that will turn the lights on and off of at least 3 trees. Use them for outdoor lights as well. 7. More love, less loot. Get really creative. Write a long, endearing letter to a loved one far away or even closeby, explaining all the reasons why they are special to you. Write a poem. Make your own gifts. If you're an artist of any kind, give an original art piece as your special gift. Whether you paint, make jewelry, build birdhouses, crochet, whatever...something made with love from the heart is what people treasure. 8. Give yourself as a gift. Offer to make 3 dinners for a busy friend or relative. There is nothing more appreciated than a home-made meal...cooked by somebody else. Give your kids the gift of time...just you and them. No interruptions. Write a nice note or make your own personal "gift certificate" and wrap it up in a pretty box. If you take time to really think about this, you can come up with dozens of thoughtful ways you can offer yourself and/or your services to others as a Christmas present. 9. Make "no-bake" goodies. Instead of spending hours by a hot oven and messing up the kitchen with flour, rolling pins and bowls and cookie cutters... why not try making a bunch of "no-bake" holiday treats. Look up online and you'll find dozens of very uncomplicated yet truly delicious recipes...that yield showy and tasty gifts for the neighbors and yummy sweets for your own family. Ritz peanut butter chocolate balls and festive Oreo balls are just a couple no-bake recipes I'll be trying this season. It's all about saving time, enjoying the time saved and still participating in the spirit of the season. 10. Make family a priority. After dinner every night during the holidays, gather your immediate family by the tree and sit down and chat. Maybe it's just you and your mate or maybe you've got a haggle of little ones. It doesn't matter. Make some hot chocolate or sip some wine. Play Christmas music. Keep it relatively quiet and simple. Turn off the big lights and just enjoy the tree lights and your candles. Read aloud A Christmas Carol. Share Christmas memories. Even if it's only for half an hour...make the time count. Let the others share their day, their dreams, their feelings. 11. Enjoy the lights of Christmas. Take a leisurely walk around your neighborhood at night and notice the festive outdoor decor of your neighbors. Or hop in the car and visit some of the more extravagant light displays around your town. 12. Do not shop til you drop. If you have to gift shop and let's face it, most of us do....limit each person on your list to only three store-bought gifts. It will be the most difficult thing you'll do this season. But give it a try. Your kids will probably NOT thank you. But maybe they'll at least try to understand your attempt at downsizing Christmas. 13. Avoid hateful people. If you have friends or family members that give you uber migraines, this year....avoid them. Don't apologize. Make no excuses. Instead invite a lonely neighbor or co-worker over for holiday cheer. Volunteer... someplace...and bring your spouse and kids along with you. 14. Just say "no". Make a list of all that needs to be done. Then edit it mercilessly. Cross off anything that you really don't want to do. Eliminate anything that adds more stress, more work, more time to your day. Learn to delegate chores to other household members. They may not do it as perfectly as you, but the job will be done. Maybe even better than your way! 15. Go ice skating. Or sledding. 16. Attend a holiday concert or local play. 17. Go caroling with friends. 18. Watch holiday movies at home with family. 19. Laugh more. Force yourself...if you have to. Don't take any holiday glitches too seriously. 20. Don't send cards. If you usually send out Christmas cards but really hate writing schmaltzy sentimental greetings to people you seldom see... Don't do it this year. You'll still get a sleigh-full of cards from others. And most likely nobody will even know you skipped cards this year. 21. Build a snowman. If you don't live in snow country...hug a palm tree. 22. Be thankful. Show gratitude toward others. Even in these dismal economic times, there are at least a few things everyone can be grateful for. Appreciate what you have. Embrace those you love. Share the Christmas spirit and pass on kindness toward a stranger but remember to be especially kind to those you love and to those you find hard to love. And thanks so much for reading my blog.